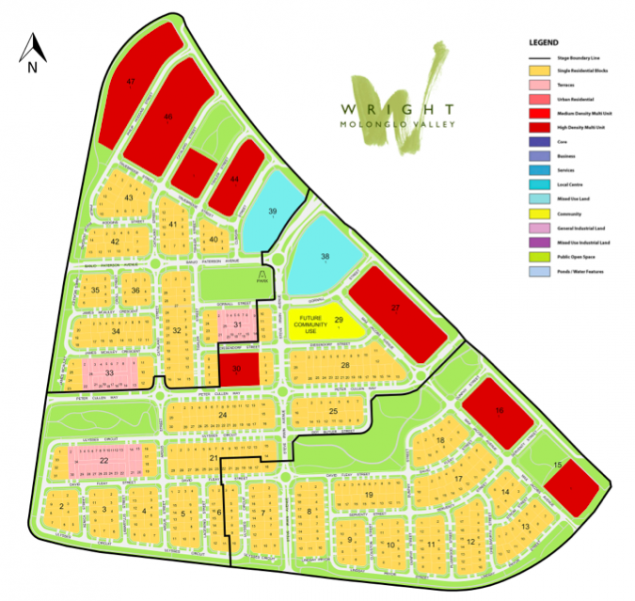 Wright is the first of 13 suburbs to be built in the Molonglo Valley, a massive development project that will eventually connect Weston Creek to Belconnen and house 55,000 residents. There are a few things I like about Wright, which is named after Australian poet and writer Judith Wright McKinney. The first is that it is possible to build a new, reasonably affordable home without moving to Canberra’s extreme north or south. (As one reader pointed out, there are plenty of homes available around the $950k mark, but I know several families who’ve built in the suburb for much cheaper – I guess it depends on what’s available when you’re looking.) From Wright, it’s a ten minute drive to the city and a 15 minute drive to Belconnen and Tuggeranong. Wright will also eventually have five open spaces and play areas, and most homes are within 800 metres of public transport. After a short time without a bus route, Wright now has the population to support public transport and ACTION buses pass through the suburb regularly. Third is a tie between getting fibre to the premises, which makes my internet seem painfully slow in comparison, and the fact that Wright experiences some rather spectacular sunsets over Mount Stromlo, particularly around this time of year. 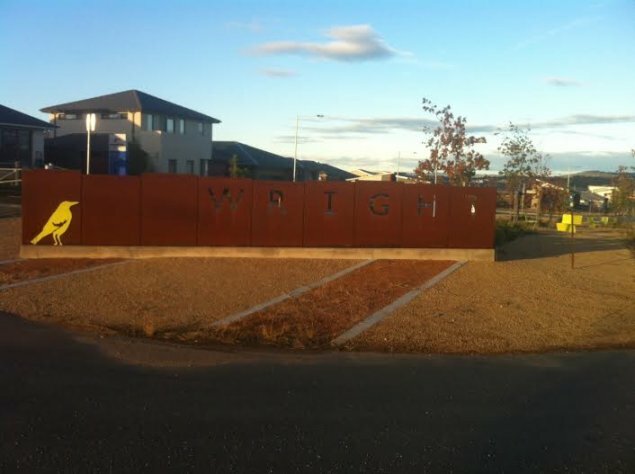 Wright is also a popular choice for first home buyers. With one bedroom apartments available off the plan for just $285,000, it isn’t hard to see why. 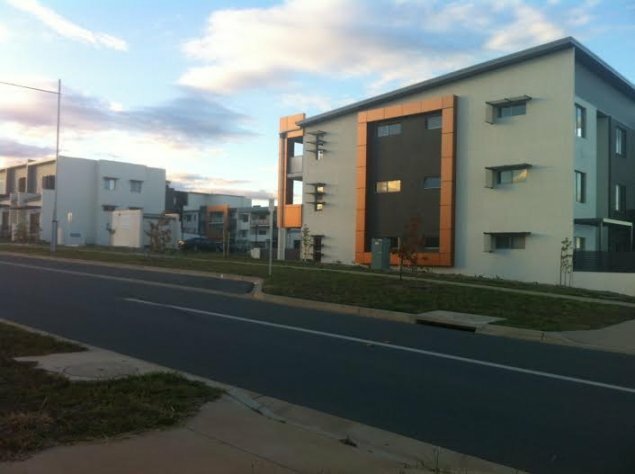 Apartment developments include Panorama on Uriarra Road, Observatory Living on John Gorton Drive and Cotter Road, and Ambiente, also on John Gorton Drive. The median unit price is $515,000, while the median non-unit price is $810,000. In the development map below, the red indicates areas of high density units, while the orange indicates single residential blocks. Even though the first home to be built in Wright was finished in mid-2012, the suburb has a long way to go before it is complete. 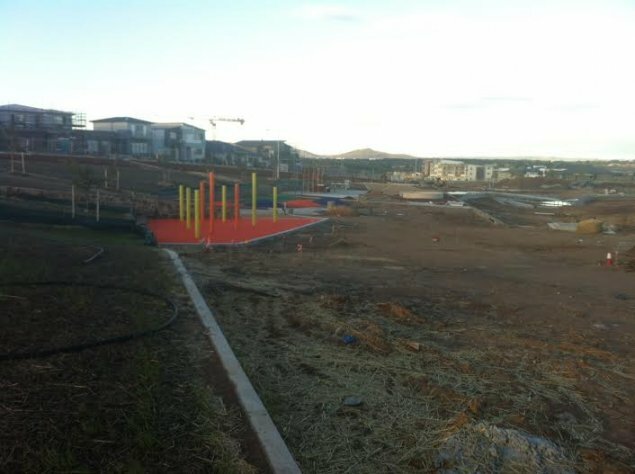 Most of the open spaces and play areas are still being built (as in the photograph below), and there are many homes under construction. On the other hand, you can easily spend a morning getting design inspiration from Wright’s display homes, of which there are plenty. If you take a drive around Wright, you may notice that some of the landscaped front gardens, which probably looked presentable some months ago, are now overgrown with weeds. I’m told that one reason for this is that the government offered grants of up to $5000 to homeowners who landscaped their front yards and submitted a plan and photograph of the finished product. Some residents spent a few hundred dollars on mulch and plants, pocketed the cash and haven’t touched their front yards since. A good initiative in theory, but perhaps it needs to be better executed in the future? When does the review of Googong happen. I can’t believe the prices in Wright and Gungahlan. We saved about $80,000 minimum on our book at Googon compared to similar in the ACT. People need to realise it’s only 10 minutes from Jerrabomerra with two new bypasses going in. We got an even better deal on our MacMansion in Dalgety! Our local member says he has a real good chance of having Myack Street upgraded to 4 lanes of divided freeway to cut the trip to Berridale to under 15 mins. He says this is exactly the kind of infrastructure that Australia should be building for battlers like me who need the long commute to listen to the full series of Open University geosciences lectures from Alan Jones, on the way to work. What a humerous piece. Possibly framed up whilst driving on some of the best roads the Nation ever built, whilst across the border too many country roads are those built over what was a bullock dray track. It will be interesting when all these souls wish to go to work in Civic, and go down that ramp leading onto the Parkway. It causes a bit of a backup even now. So where does Steve Irwin Ave fit in? Steve Irwin was “recycled” so that makes him part of the environment. “The first is that it is possible to build a new, reasonably affordable home ” really, some friends of mine looked into building in wright and couldn’t find anything under $950k. I am not sure $950k is considered affordable. If there are people out there willing to pay $995k+ for this then they have a problem. The photos show old styled furniture and a modern house just don’t work either! Its a shame, because I watch Grand Designs (both UK and Australian versions) and they seem to get a lot more bang for buck than what we get in Canberra. I was hoping the mass PS sackings would burst the bubble, but it appears not. 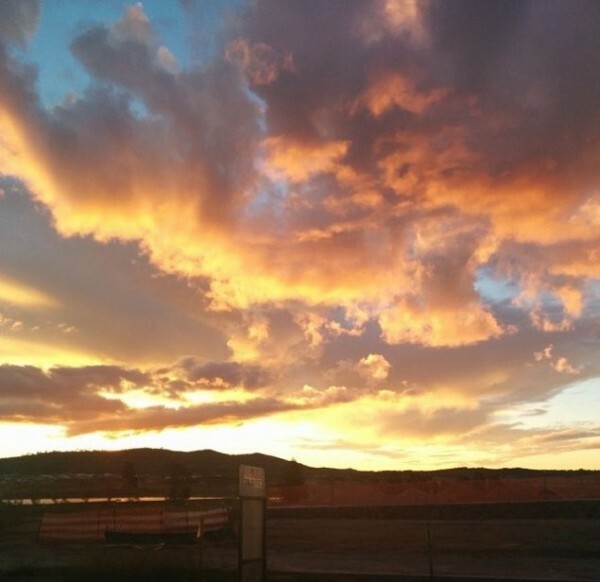 I definitely think I will retire some place other than Canberra that’s for sure…. assuming I can actually afford to retire, or even reach whatever the retirement age will be. Steve Irwin, when he wasn’t annoying wildlife for the amusement of couch surfers was an avid and active Environmentalist. He is also dead. Gone are the days, hopefully, when some sleazy Sir Les Patterson can lean on his political mates to immortalise himself as road signage. G’day chewy, I agree, I think this one sums up how we both feel, McMansions, small blocks, close living and waaaaayyyyyy overpriced. I don’t know about not trying to jam as many monstrous houses onto tiny blocks as possible. The average block size is only 500 odd square metres and most of the houses tend towards the McMansion. Good place to live if you enjoy looking out of your bedroom window at your fence and/or neigbours house. It should encourage some very close knit community living. Some of the houses have, or will have, very pleasant views out to the front. But sides and back look straight at fences and those bedrooms in the display homes with thin high windows for privacy I reckon feel like prisons. That’s going too far with ‘affordable easy care’ blocks when you can’t have normal windows in a bedroom. I just spent some time looking at the wright offerings for sale and I think something very dodgy is going on out there. Most of the prices are for the house only not the land. How can someone who qualifies for the land rent scheme afford to pay $890k for the house only, not inclusive of land. This link is a prime example, it’s the price for the house only….WOW am I missing something here, so someone on land rent approval for affordable housing is meant to buy this – smells like a rat to me. I’ve been wondering about some of those land rent ads myself (I think I’ve seen ones in Gungahlin too). Surprisingly luxurious. The building restrictions in Wright are tighter than in other suburbs, which I assume is in part to minimise the McMansion effect. 4 and 5 bedroom houses on 550 sq m blocks sounds like McMansion to me! Just had a look at the Land Rent Scheme. Wow, looks like Hire Purchase for land! You build a totally non-portable asset, your building, on something that you do not have long term title over. As you keep paying, you don’t lose your building. I can’t see any real savings for the purchaser, just the strong likelihood that they will pretend this is freehold, just as everyone has pretended that leasehold is freehold. The government, developers and financers of this scheme are using the complexity and drip charges to basically overcharge the purchasers, as far as I can see. A lot of people are going to make a lot of money out of the optimistic suggestable punters out there, which will be why this will be the “Next Great Thing”. Rush in, don’t miss out! More eyewash about a “green” suburb, just like as they did with Gungahlin. More land going under mediocre suburban subdivisions. The usual oversized houses on tiny blocks, poorly oriented and with lousy, next to non-existent, public transport. They also are ignoring that it is in the path of another bushfire disaster, as they grow more firewood above it in the Arboretum where it all burnt down not so long ago.. There is no transport easement, just roads and the infrequent buses take a quarter hour to get you to that garden of delights, the Woden Bus Interchange, where you get to wait for another bus to take you to where you really want to go. Net result people will drive. Surprise, surprise. 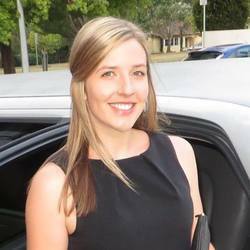 When are we ever going to see a comprehensive plan for transport in the ACT? The suburb was definitely more affordable before they changed the terms of the land rent scheme a little while ago. Some of the houses in the suburb are outrageously expensive, but I know families who’ve built lovely homes for much cheaper than $950k too.